Many people think that succulents are indestructible, but this couldn’t be further from the truth! Succulents still have needs just like any other plant. Proper attention to watering and light needs are critical to understand for this group of plants. Although succulents can be considered tougher than many other types of plants, their needs still need to be met in order for them to look their best. Many of you may not be familiar with this word, but once I describe what it is, you may be painfully familiar with it! Etiolation is when succulents, or other plants, stretch out too much. This occurs when a plant is grown in much lower light levels. It is characterized by longer, weaker, stretched out growth. The plant will no longer be compact and the leaves will be further apart from each other. How do you fix etiolation? You will need to introduce your plant to stronger light. Most succulents require direct sunlight to look their best. However, don’t expect your etiolated plant to suddenly go back to normal after you introduce it to stronger light. You may need to cut your plant back so it can regrow (in stronger light) and look like it should. You can also propagate the parts that you cut off by rooting them in either water or soil, and then be sure to grow them in proper lighting so that they don’t stretch out anymore. Yellowing leaves can be a sign of both underwatering and overwatering. How do you know the difference? Observe your plant. Is your soil bone dry? Are the lower leaves yellowing and perhaps a little bit wrinkly and shriveled? If so, your succulent is likely too dry. How do you fix these issues from being too dry? Be sure to THOROUGHLY water your succulents when you water. Make sure to water all of the potting mix until water comes through the drainage hole. Then wait until your potting mix is mostly completely dry again before watering. The trick is not to wait TOO long after the soil has completely dried out! What if your succulent has yellow leaves that are a little soft and mushy? Perhaps your soil is wet, and has been wet for a long time. Maybe it isn’t even just the lower leaves that are yellow. These are all indications that your succulent has been kept too wet. How do you fix these issues from keeping your succulent too wet? You should immediately check to make sure that your succulent is not sitting in water. Always discard extra water and ensure that the plant is not sitting in water. Make sure that all your pots have drainage holes. 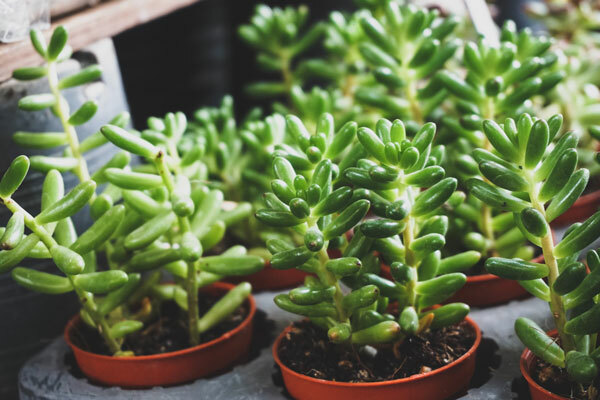 Cut off any mushy growth and allow your succulent’s potting mix to dry out completely before watering again. What if your succulents are properly watered, but you suddenly have yellow or brown, dry spots on the leaves? 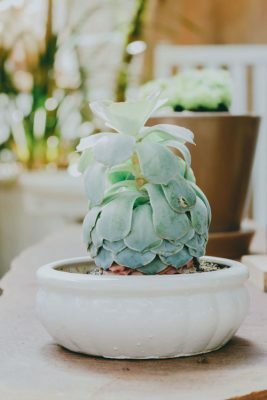 If you had your succulent growing in a spot with less light, and suddenly move it to full sun or a spot with much more sun than it was previously in, you likely sun burned your plant. Think about it. If you have been cooped up inside during the winter, and you suddenly go on a beach vacation. You lay on the sunny beach with no sunscreen. Half an hour later, you will be sun burned. The same thing will happen to plants! How do you remedy this situation? Anytime you introduce any plant to much stronger light, you need to do so gradually. Never move a plant that has been in a shady area into an area with extended periods of direct sun right away. You’ll need to do it gradually so that you don’t shock your plant. This is especially important if you’ve had your houseplants indoors, and then move them outdoors. Always let them acclimate in full shade first for a few days. Then give them maybe a hour of sun each day, and gradually increase the amount of direct sun little by little. Succulents ARE tough plants, but they still have their needs in order to look their best. So take a little bit of time to understand how to care for them, and they will reward you for a long time to come! This entry was posted in Blog, Succulents. Bookmark the permalink.